Linda Sager (center) with several Boy Scouts from Troop 201 at Grace United Methodist Church with a portion of the food collected. GALLIPOLIS — Mail carriers across Gallia County recently helped collect food for the hungry during their Letter Carrier’s Food Drive, marking the seventh year of the event in Gallipolis. Each year the post office sends out post cards in April reminding the public that they will be collecting non-perishable foods the second Saturday, which happened to fall on May 12 this year. The public is encouraged to place food items in their mail box or on their porch for pick up that day as post office workers collect it. Fortunately, the letter carriers are not alone in this. Boy Scout Troop 201 of Gallipolis came out in force that Saturday to help collect and sort the food, which nearly reached 2,000 pounds. “The Boy Scouts are great to help. When the city carriers are walking around town and there are five houses in a row with boxes of food, they are great to help collect that,” said Mary Bea McCalla, of the Gallipolis Post Office. Each year the amount of food collected drops incrementally, according to McCalla and Mike Ferrell, a postal worker that helps coordinate the drive. “This year we collected a little over two thousand pounds, down just a little from last year. Our best one was the second year, we collected about 3,900 pounds,” said Ferrell. Each year the National Association of Letter Carriers sponsors the food drive across the country. According to McCalla, it’s an optional program for post offices but Gallipolis readily participates annually; everyone from rural carriers to the office workers chip in. Each year the food pantry at Grace United Methodist Church (600 Second Avenue) receives the food to then redistribute to those in need. 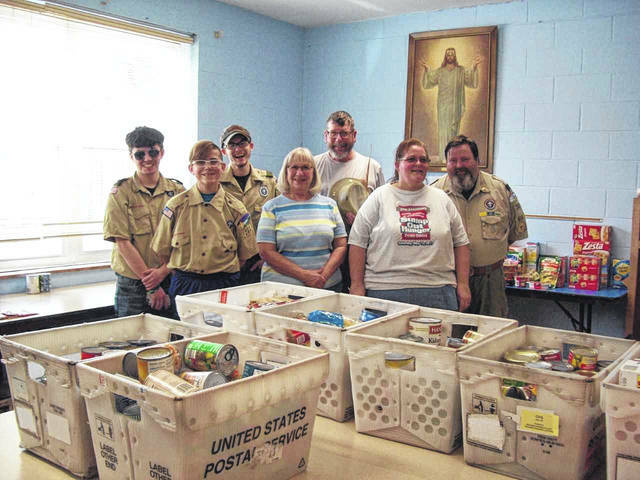 “Once again the community, with the help of the post office and Scout Troop 201 has provided an abundance of food for Grace United Methodist Church Food Pantry, we are grateful,” said Linda Sager, who helps operate the pantry at Grace. To find out hours or other information about Grace’s food pantry, call the church at 740-446-0555.